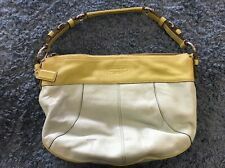 NWT AUTHENTIC Beautiful Coach purse pebbled leather sea foam/mint green RV $358! COACH NATURAL WEAVE STRAW MINT GREEN WHITE BASKET TOTE BAG PURSE SATCHEL RARE! This page was last updated: 23-Apr 16:01. Number of bids and bid amounts may be slightly out of date. See each listing for international shipping options and costs.